Other Products by Musashi. Search other Protein Powder products. 32.9 grams Protein Per Serve! Musashi Bulk Extreme delivers everything you have come to expect from an industry leader in sports nutrition. Quality, Efficacy, Flavour and Value — all bundled into one big bucket. This truly is the quintessential blend of protein, carbohydrates and fats to fuel muscle recovery, growth and energy for training. There certainly is nothing worse than ending up in the gym, staring at the heavy weights and wondering why you don't have the motivation to train like everyone else. Perhaps you didn't sleep enough last night, or maybe you didn't take as much pre-workout as the guy over in the corner of the gym lifting more plates than you can count. And what's worse, he doesn't seem to be breaking a sweat. Hang on, it's winter - that's okay. Phew. When we don't get enough quality calories in, with adequate protein, we are never going to feel overly energised and motivated to exercise. This is when our body is simply telling us to take it easy and conserve our energy, which makes sense, to a degree. It's a biological self-preservation tactic. At ths point we might be more inclined to take a nap or flop on the couch nursing the TV remote than pump weights until our muscles bulge. 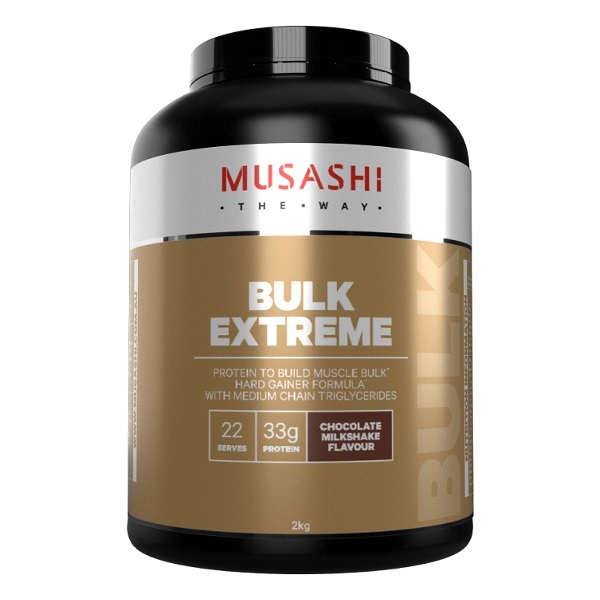 Musashi Bulk Extreme contains over 32 grams of quality protein. And we're not talking about low quality protein either. The whey protein contained in Musashi Bulk Extreme has been demonstrated to stimulate muscle protein synthesis, which is basically the signal for muscle growth 1. And if you're thinking that 32 grams of protein is too much, or the body can't process that much protein in one hit, an interesting piece of research was published in 2016 indicating that the muscle protein synthesis responses from 40 grams of whey protein is much greater than that stimulated by 20 grams, regardless of the amount of muscle mass the individual has 2. So, 32 grams of dairy protein could be just what you need to trigger new growth as a result of resistance training. If you're not already excited enough to tear the lid from this product and start pouring in fresh icey-cold milk by the gallons (not recommended), it also contains 4 grams of Medium Chain Triglycerides per serve, which are specialised fatty acids that readily convert to energy, and are less likely to be stored as fat. They have also been quite popular recently due to their cognitive enhancing effects. So, not only are you physically energised, but also more mentally alert, ready to focus with intensity on each repitition of every single set. This is how we get results. Mix 90g with 500ml of skim milk or 300ml water. Shake well and consume. 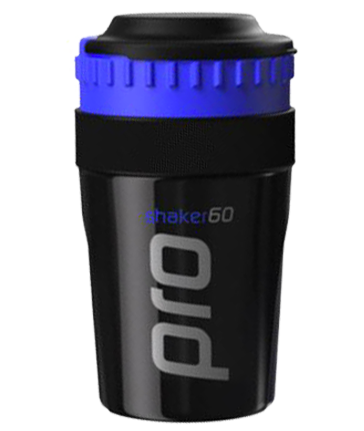 Drink up to 2 shakes per day. INGREDIENTS: Musashi Bulk Extreme Protein Blend (61%) [ WHey Protein Concentrate, Whole Milk Powder, Skim Milk Powder, Whey Protein Isolate, Emulsifiers (Soy Lecithin, Sunflower Lecithin)], Maltodextrin, MCT Powder (7%) [ Medicum Chain Triglyceride Oil (70%), Modified Starch (1450), Maltodextrin, Emulsifier (471)], Cocoa Powder, Flavours, Vegetable Gum (Guar Gum), Sweetener (Sucralose).